Prolific British writer Alexander McCall Smith walked onto the stage of Campbell Hall on Friday, Nov. 14, to a packed audience. The cheers and applause only grew louder when they realized that the internationally acclaimed author was wearing a traditional Scottish kilt. 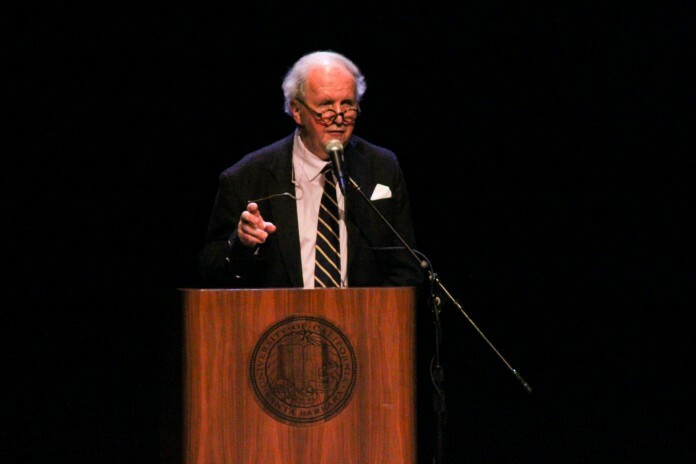 An Evening with Alexander McCall Smith was put on by the University of California, Santa Barbara Arts & Lectures, inviting students and residents of the greater Santa Barbara area to join McCall Smith in a night of laughter and discussion. The talk about “the very small things of life,” as McCall Smith put it, encompassed some of his experiences traveling and time spent working on his novels. To conclude his hour-long lecture, McCall Smith withdrew a piece of paper from his pocket, unfolding it and peering out at the audience over his spectacles. Normally, he concludes his lectures reading poems penned by another author, but the audience was treated to a poem he wrote earlier that afternoon, showing off his quirky sense of humor and observant nature. Writing with wit on the spot comes easily to him, as shown in how quickly he penned the poem and his works. McCall Smith has written over 100 novels, including the internationally bestselling series The No. 1 Ladies’ Detective Agency, 44 Scotland Street, and The Sunday Philosophy Club. In addition to writing mystery and crime novels (although he vehemently denies being a crime novelist), McCall Smith also writes children’s books and academic texts. The author recently released his latest installments The No. 1 Ladies’ Detective Agency and The Handsome Man’s Deluxe Cafe, and he is slated to release a modern rework of Jane Austen’s Emma in 2015. McCall Smith was born in what is present-day Zimbabwe. He was educated at the University of Edinburgh, where he graduated with a PhD in law, and he then went into academia at Queen’s University Belfast and the University of Botswana. He soon returned to the University of Edinburgh, where he is currently Emeritus Professor at the School of Law. McCall Smith has also worked with the British government and United Nations on bioethics, serving on a number of commissions, and is widely respected as an expert on the subject.